for some reason i don't quite recall i tend not to post my works in progress. 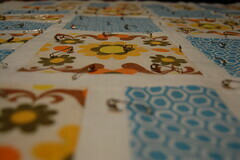 but i've been so enjoying my quilting the last few days i wanted to share a few sneak peeks. this first one is a playmat for our next arrival. i'm slowly working up the critical scale - first a toy quilt, now a baby quilt, next one for M, eventually working up to one for us. i ran out of pins basting it last night, about 2/3 done. having just read lisa call's basting tutorial i'm thinking perhaps i overdid it a bit, as she pins around 6" apart, whereas i'd read other advice that you shouldn't be able to put a fist down without hitting a pin. if i can make it to the button shop today i'll get more pins, but if not i have the centre section fully pinned and can remove those and pin the edges once the middle's quilted. my walking foot arrived this morning so i don't think i'll be able to resist having a go tonight. and here are the first of M's stars. the tutorial utterly and totally rocks. i realised once i'd had a go how it neatly sidesteps all the problems of stretching on the bias you're likely to encounter sewing triangles. 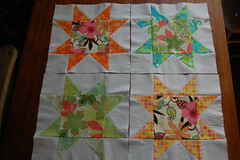 i'm gathering a sizeable bag of offcut triangles that i may use on the backing or binding, or a spin-off doll quilt. the cutting is pleasantly straightforward and the sewing goes by in no time, i was planning to have a quick try at a sample square when i came to a halt on the playmat and managed all 4 yesterday, which included prewashing the fabrics. i really love em, but please reassure me, there is no such thing as too colourful when you're 4, right?